"M'lord, I am sent to show you to chambers." Terminal only matters if attached character leaves play. If a card effect returns an attachment to its owner's hand (e.g. Weapons at the Door), it does just that, Terminal or not. 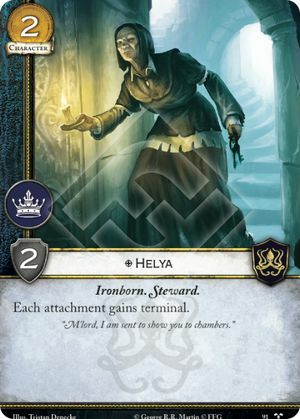 Characters and their attached cards leave play simultaneously, so if Valar Morghulis kills multiple characters along with Helya, all their attachments go into the discard pile.